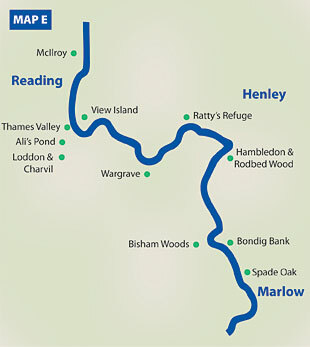 The Thames from Reading to Marlow is what many people will think of when the name of the river is mentioned, with rowing clubs, elegant bridges and buildings, and green fields. During the regattas, this part of the river is full of people, but away from the events, there is plenty of green space and wild life to find. Here the former gravel pits make havens for plants, insects and birds. The reserves beside the Loddon at Charvil are popular with birdwatchers all year round. The flood meadows are fewer than upstream and therefore are even more precious. 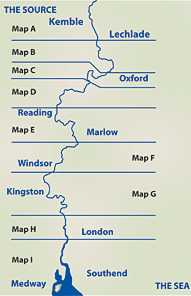 This is why the River Thames Society has created its own reserve called Bondig Bank, near Marlow. The grass verges and bushes on the bank are trimmed conservatively, balancing the need for human access with space for wildlife.